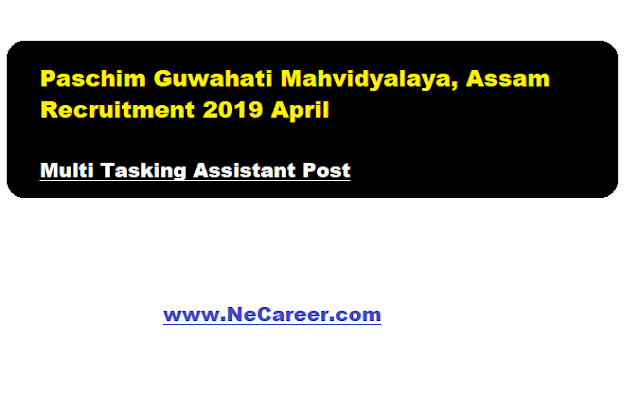 Paschim Guwahati Mahavidyalaya Recruitment 2019 April - Multi Tasking Assistant Posts:- Welcome to North East India's No. 1 Job Portal NeCareer.com . Paschim Guwahati Mahavidyalaya has issued a job notification in April 2019. According to the recruitment, applications with full bio-data are invited from the eligible and interested Indian Citizen candidates for contractual appointment as Multi Tasking Assistant (MTA) (Special cadre in General Administration and Accounts) of Paschim Guwahati Mahavidyalaya, Dharapur, Guwahati. Find more details about this job in below section. Eligibility : Candidates must be Graduate in any discipline except fine arts, music, languages and possess computer skills for handling data and text on computer. Candidates experience in desired field is desirable. Desirable Qualification/ Experience: Applicants should have 3 months to 1 year experience in Server Administration / LAN /DBA/Technical troubleshooting support in Hardware and proficiency in MS Word, MS Excel, MS power Point, etc. Age of the applicant must not be less than 21 years and more than 30 years on the last date of application. Application Fee: An examination fee of Rs.300/- (three hundred) only must be deposited in the A/c No. 7282010001728 IFSC Code: UTBI0RRBAGB, Assam Gramin Vikash Bank, Dharapur Branch, Dharapur, Guwahati-781017. The fee deposit slip be scanned and attached with the “Application Form”. Eligible and Interested candidate should apply through online by sending their CV/Bio-data in the prescribed format to email ID: pgm17dharapur@gmail.com only within 07 (seven) days of publication of the advertisement in news paper (Assam Tribune). The prescribed application form and other details are to be downloaded from college website www.pgmdharapur.ac.in available in the “Notice Board” and named as “APPLICATION FORM” and “ADVERTISEMENT FORMAT”. Only short listed candidates of the required phase of selection will be called for the interview.